President Muhammadu Buhari is facing the toughest time as Nigeria’s President, no thanks to the incessant killings in some parts of the country. Though the President had said in a statement released over the weekend by Garba Shehu, his spokesman, that the spike in activities of bandits and kidnappers across Nigeria has made him one of the unhappiest leaders in the world he did not blame “incompetence” as the cause of the killings like he did in 2015 during Goodluck Jonathan‘s tenure. The attacks in its wake, have left many dead and properties destroyed, a developing which led to some protesters marching to the presidential villa in Abuja on Saturday. Reacting to the attacks, Buhari said his mind was constantly preoccupied with the insecurity challenges in the country. President Buhari described as “ridiculous”, claims that he is indifferent to the incidents. The president explained that as human, he understands the pains of the victims of the attacks. “The politicisation of tragedy reveals the darkest sides of our primitive politics. Almost every week, I summon my security chiefs to get an update on the strategies being devised to defeat these mass murderers,” the President had said in the statement. Apparently, this is unlike “General” Muhammadu Buhari who said in 2015 that Nigerians were dying during Jonathan’s administration, due to “incompetence”. A fact check by Naija News shows that the President has tagged the uproar by Nigerians on the killings in the country under his administration as “politicisation of tragedy” and not due to “incompetence” as stated by him in 2015. 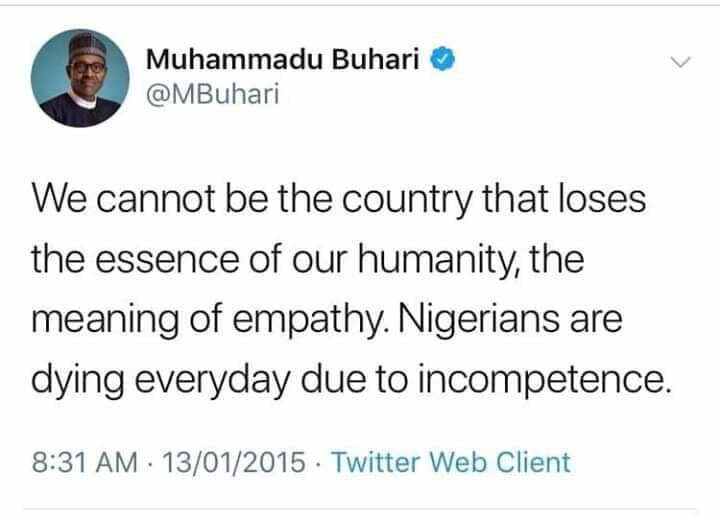 Displeased with the killings in the country then, Buhari had tweeted in January 2015: “We cannot be the country that loses the essence of our humanity, the meaning of empathy. “Nigerians are dying every day due to incompetence,” Buhari tweeted on January 13, 2015. Buhari tweet on killings in Nigeria in 2015.